The Boosting locomotion is a hand locomotion; a Booster can be enabled on each hand of the player via locomotions cycling. As with any other hand locomotion, this must be done for each hand for which you want its locomotion to become active. Boosting allows players to fly around like Iron Man or Jango Fett. Upon input, a Booster blasts a jet in one direction and thrusts the player in the opposite direction. The propulsion can be aimed individually via rotation of the motion-tracked controllers. Boosting offers a more visceral and comfortable flying experience than some more abstract flying locomotions out in the wild. Many flying locomotions don't provide sensory feedback. But because of details like haptics, fuel, and particle effects for visualizing different intensities, boosting can become familiar to the player quickly. It feels more realistic to fly via acceleration as a result of fire coming out of your controller than it does to arbitrarily fly at a steady velocity whenever a button is held down. Most players easily forget they are standing on the ground in their living room. 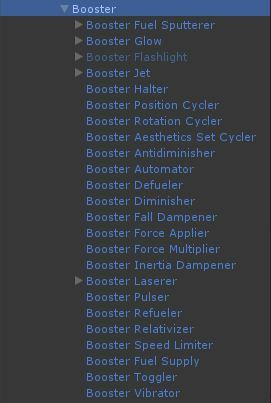 As the flagship locomotion of the Moon Motion Toolkit, Boosting has the most features and customizations. Its appeal toward low-gravity experiences is responsible for the space vibe of the toolkit. However, its aesthetics could easily be swapped out for bubbling jets in an underwater environment, for instance (using the Booster Aesthetics Cycler module). There are many modules for the Boosting locomotion, each responsible for a different aspect or function of boosting. These allow it to be customized deeply and to have each aspect be controlled via input.